The Hualapai Tribe's plan to create a skywalk over the Grand Canyon in Arizona has generated immense interest, tribal executives say. The Grand Canyon Skywalk is a glass bridge that extends over the edge of the canyon on the western rim. The skywalk will be completed by midsummer and will be open to the public by the end of the year. 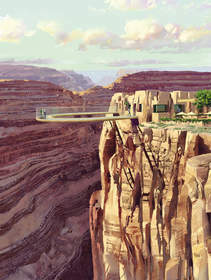 The skywalk is part of Grand Canyon West, the tribe's destination resort. The tribe is heavily promoting tourism as a way to generate revenues.